This 1-for-1 promotion is valid only on weekdays, from now till 14 Jul 2016. PARK’s Blue Cheese Burger (S$21.50++) is unsurprisingly one of the restaurant’s bestsellers and what a burger lover must definitely order. Juicy medium-doneness beef patty with avocado slices, blue cheese sauce, crispy bacon, fried egg and sautéed mushrooms are sandwiched between two fluffy sesame buns – it is so much flavours in one bite. The awesome burger is served with a mixed salad and fries or mashed. Too full to devour an entire burger? Go for the all-new Chilli Crab Sliders (S$14.50++) instead. It is heartwarming to see how our beloved national dish has been successfully incorporated into these tasty handheld sliders! These seared crab cakes with sweet chilli sauce are stuffed in steam buns and finished off with cherry tomato halves. 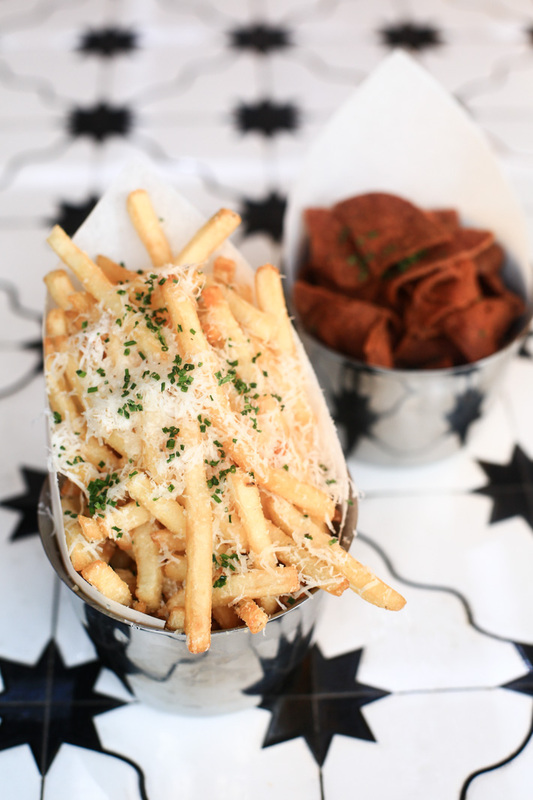 Of course, you have to complement your mains with PARK’s divine Truffle Fries (S$11++). Served in a tin bucket, these piping hot aromatic fries have been cooked with white truffle oil and loaded with generous amounts of parmesan cheese. One of the better renditions in town, and with standards like this one here, truffle fries will stay classic and irresistible. No expense has been spared during the deep-frying process to achieve an extremely crisp texture for these thinly sliced Spam Chips (S$8.50++). PARK at Holland Village is jumping on the bandwagon with the obsession of salted egg – but we are totally digging their rendition of Salted Egg Ribs (S$29.50++)! This Salmon Papillote (S$17.80++) looked unassuming, but it turned out to be one of the best dishes we had! Wrapped in parchment paper with a complex butter-based sauce and pepper barigoulle, the beautiful fish is baked to perfection and lightly flavoured with the veggies and sauce. Honestly, this was so good that we would totally return to PARK just for it! All hail PARK’s Truffled Mac & Cheese (S$13.50++)! This ultimate crowdpleaser – baked with sliced turkey ham and cream truffle – is listed in our list of Best Mac & Cheese in Singapore, and it has been a constant favourite among PARK’s regulars! Prepared with four different cheeses, the outermost layer is wonderfully crisp and the insides remain consistently gooey with an addictive saltiness that is derived from the cheeses. 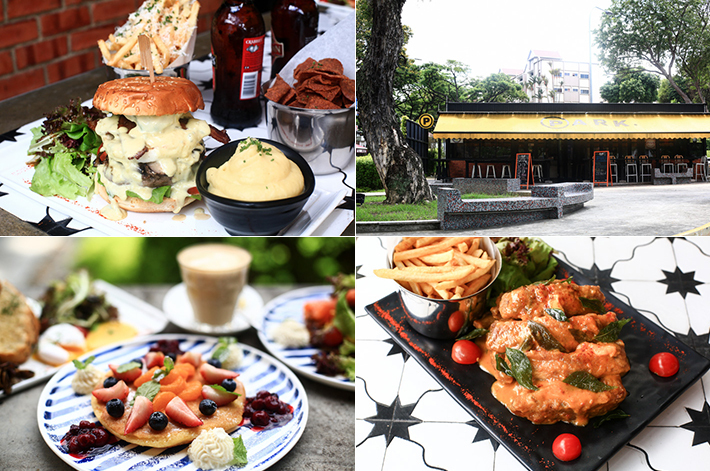 It seems like pancakes will never go out of style and PARK has revamped the classic homely dish into an Instagram-worthy brunch must-order. The Tofu Pancake* (S$12.80++) is basically a soy-based fluffy pancake topped with mixed berry compote, mandarin oranges and sour cream – all prettily plated and ready to smile for your cameras. And once the photoshoot is done, tuck in to subtle sweetness that is well complemented with the tartness from the fruits. The Pulled Pork Tacos (S$14.50++) features four corn tortillas filled with barbecue sauce, toothsome slow-cooked pork shoulder, shredded parmesan and mixed vegetables. Not for the faint-hearted, because the pulled pork shoulder is so flavourful with a hint of smokiness from the sauce; but that’s precisely why we enjoyed ours. Last but not least, PARK’s traditional Baileys Tiramisu (S$8.90++) is a homemade goodness with a twist to the usual coffee-flavoured Italian dessert. Alternating layers of mascarpone cheese whipped cream and delicate sponge layers, jazzed up with prized Baileys. How to not love this creamy goodness? No, the Baileys did not overpower, neither is the dessert cloyingly sweet. *Note that these brunch items are only available until 5pm. From now till 14 Jul 2016, enjoy one-for-one main courses when you quote ‘ladyironchef’ upon making payment! This post was brought to you by PARK at Holland Village. Hi. Does the “1 for 1 main course” applies to all main courses on the listed Tuesdays, Wednesdays and Thursdays only? Hi, Jamie. The 1-for-1 promotion only applies to the selected main course. Burger on Tuesdays, Salted Egg Yolk Pork Ribs on Wednesdays, and Salmon Papillote on Thursdays. So is there promotion on Friday as well? The 1 for 1 dish did not write for Friday. @Wanqi: The 1-for-1 promotion is only for Tuesdays to Thursdays.